Carrot and Leek Soup is not my vision; rather, it belongs to my little boy who also loves to cook. Much like my husband and I love food, our little boy also loves food. He prepares breakfasts on Sunday mornings, and takes great care in the way he scrambles the eggs or chops the fruit for salad. He also spends time in the kitchen with me, that is when he’s not otherwise preoccupied with legos or Lemony Snicket books. Many people ask me how to get their kids to enjoy real foods, and I answered this question in my talk for the Healthy Life Summit, one thing I invariably tell them is to involve children in the growing, selecting and cooking of foods. Choice excites children, and empowers their love of real food. I often set a small amount of our food budget aside for my little boy – to let him select some foods not only for himself, but also for the whole family. This helps him to understand the importance of his choices and how they affect other people. 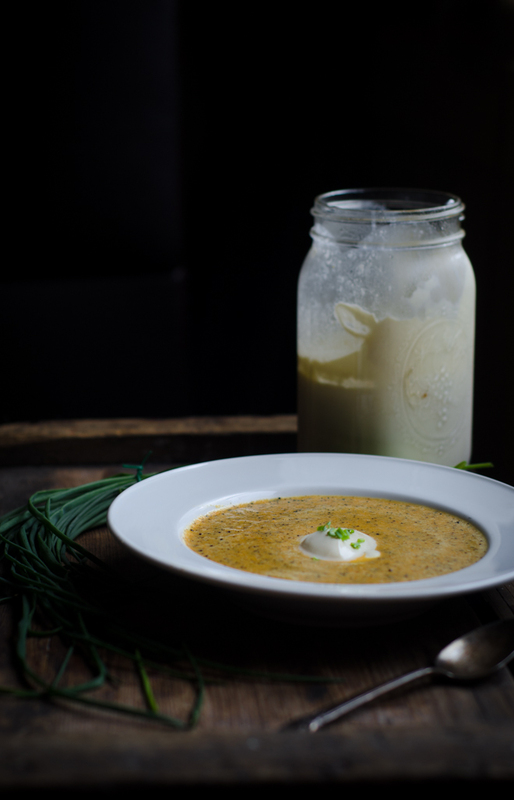 The story of this Carrot and Leek Soup began last week. My husband and I had busied ourselves with our last minute work on the farmers market. Too busy to cook, I took my hungry boy to a nearby restaurant for a grass-fed burger – and within a few days we came down with a nasty stomach virus that left us weak, riddled with pain and suffering from fevers up to 103 F. For much of that time, we were unable to eat anything but broth, applesauce, and ginger beer. 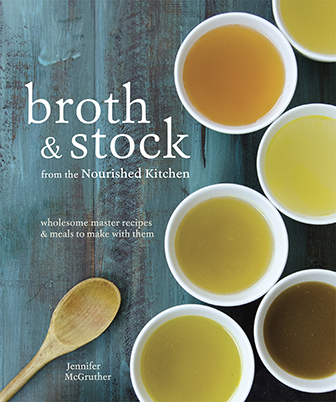 As the days of fever and illness wore on and on last week, his frustration with the bland and unsatisfying diet of applesauce and broth increased. On day four, he nestled his head against my shoulder and cried – upset at sickness, upset at fatigue, upset at the lack of decent food. 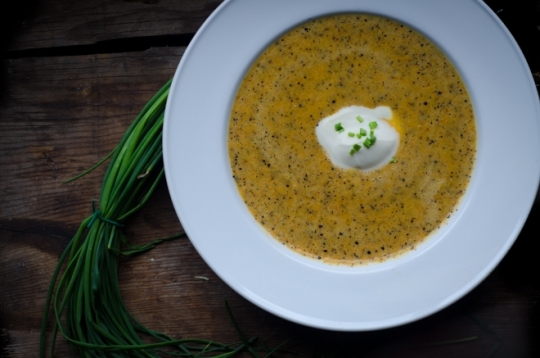 Our nutritional therapist had encouraged soups for the first few days as illness abated, and I offered to him that he could create our next soup, and he created Carrot and Leek Soup with Toasted Mustard Seeds. On the first day after our symptoms had largely disappeared, he tore through the refrigerator and my cupboards – pulling out vegetables and spice upon spice. Then I pulled the Flavor Bible off of the book shelf, and we sat together and looked through it for direction. He knew for certain he wanted to combine carrots and leeks, so he flipped through until he reached those sections and looked through once more to see which compatible and complementary flavors they shared in common – toying first with sweet bay before settling on mustard seeds and chives. The book helped him, as it often helps me, to find compatible flavors when I feel otherwise stuck for ideas. It’s a brilliant book, heavy and complete. The book lists each ingredient, from the mundane to the exotic, alphabetically along with characteristics of the ingredient and a list of complementary flavors that were compiled from the menus of leading chefs. 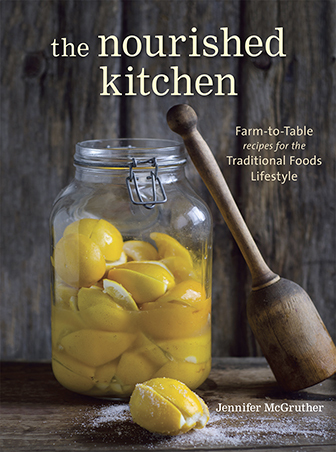 It is a book ripe with inspiration, and is particularly helpful when you may not be familiar with an ingredient – such as one that might appear mysteriously in your weekly CSA box. After he selected his ingredients, we began cooking together – chopping, sauteing, simmering our way through leeks and carrots, mustard seed and stock for a simple soup, and the first substantial bit of real food we’d enjoyed in days. The flavor of mustard blended beautifully with leeks and carrots, giving the traditionally sweet vegetables a pleasant bit of an acidic edge. And he felt good – nourishing his wrecked little belly’s want for food, and nourishing his sense of self-efficacy and mutual support. Set a heavy-bottomed stock pot (like this one) over high heat. Toss in the mustard seeds, and cover the pot. Allow them to cook in the heat of the stove until you hear them popping, then immediately reduce the heat to medium-low, and stir in the butter. When the butter melts, stir in the leeks and carrots. Sprinkle the vegetables with salt, cover the pot again, and sweat them until the leeks soften and become tender - about 4 minutes. Increase the temperature to medium-high, pour in the chicken broth and simmer, covered, for 30 minutes. Turn off the heat. Blend with an immersion blender (I use this one.) until smooth, then stir in the milk. Adjust seasoning with additional salt as you like it, then ladle into soup bowls. Serve with a dollop of sour cream or homemade yogurt and a sprinkling of fresh chives. So excited for our Friday farmers market to get a bunch of carrots! We are almost completely eating from the farmers market and have been looking for something new and fresh! I’ll have to serve this with some meat on the side or a grilled cheese! Love all your ideas and photos! Jenny, Your nourishing ideas have inspired me so much! The mustard seed toasting is one detail I’ll remember and use in other recipes. Lovely concept, images, all very engaging and real. Thank you for all that you do. Jenny, that soup sound beautiful, I’m looking forward to trying it. Just wondering if which mustard seeds to use – yellow, black or brown? The soup and the story behind it are both lovely. How old is your little boy and when did he start taking an interest in helping out in the kitchen? He’s always been around cooking since he was a baby, and I’d keep him in the sling while I cooked supper. He started taking an active interest in cooking at 5 (his favorites to make are scrambled eggs, baked salmon with herbs, and lemonade). He’s 7 now. Congratulations to your son on a delicious and nourishing soup! I substituted coconut oil and coconut milk for the butter and milk to make it dairy-free, and it’s the best soup I’ve had all month (and I eat a lot of soup, so that’s saying something)! Thanks for sharing! I bet that’s a LOVELY combination. Jenny – this looks lovely. Tell your lil’ man – Job Well Done!!! What a great recipe and lovely story. I’m glad you are both on the mend, and that you have something wonderful to share together. I made your soup and I thought it was delicious but my daughter and boyfriend; who will eat anything, did not like it at all. I added just 1 tablespoon of brown mustard seeds so that the flavor wouldn’t be as strong. Is it supposed to have a smokey taste? I may have burned the seeds but I watched it carefully and my soup looked just like your photo. The sour cream I used made this meal even more amazing. Sadly, no one else thought the same. I just made this and it was DELICIOUS! Thank you! What a great little boy you have that already knows how to cook. His carrot leek soup sounds and looks yummy!!!! I made this last night for our family and it was fantastic! Thanks for the recipe! Just picked up my CSA and I was browsing your website for some rutabaga recipe and stumbled across this. I also received leeks and a huge bag of purple carrots in my CSA so I might have to try this. Thank you for a beautiful recipe! I must get this fabulous book!! I am definitely going to try this recipe. Love the choice of toasted mustard seed! Easy recipe and quick. We found that it was missing something flavor, we added ground coriander after the soup was done and that worked well. It also did not need the cream. We also thought that Ginger would be a good addition. This is really quite good. Homemade stock and fresh nice carrots are key. I didn’t have mustard seed so I used some whole grain mustard and rinsed it so it was just seeds. I didn’t add the milk at the end, but I do think it would have been a tasty addition. Made this tonight with our own winter carrots and it was wonderful !!! You have a chef in the house !!! I did roast the carrots with whole cloves of garlic , olive oil , salt and pepper in the oven first before adding to the leeks. The toasted mustard seeds really sent this over the top ! I felt like I was on a date with my husband at some fancy restaurant ! so easy too ! Thank you ! We are making this for dinner tonight! Its perfect since we had leeks and an abundance of carrots from our CSA box. The smell of the mustard seed as you take the lid off is so tantalizing! Can’t wait to try it.